Avian influenza or “bird flu” are popular names of Influenza A subtype H5N1 that has been infecting humans through bird-to-human transmission. 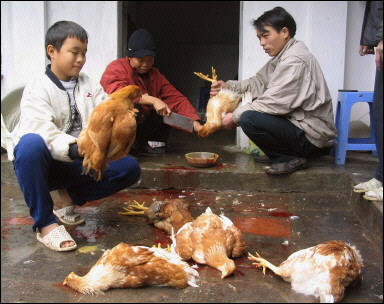 Avian influenza affect multiple species of wild birds, domestic birds, and also infects humans. A number of web-sites can introduce you to the complex ecology and epidemiology of avian influenza. We use the differential equation models to predict the cumulative number of human cases. First we pre-estimate some of the parameters of the model from the biological literature. Data exist of the demographics of poultry as well as human demographic parameters. Then we estimate the remaining parameters of the model through a process called callibration or fitting. The red data points in the figure below are used for callibration of the model. Then we obtain the model predictions and we compare it with the callibration data. The figure to the left shows quite good agreement between the model predication and the callibration data. Our callibration data set ends on December 31, 2009 but we can run the model for longer time than the duration of the callibration set. Future projections of the model can be plotted alongside data that were obtained since January 1, 2010. Those are the green data points in the figure. Model projections and incoming data from WHO show good agreement. We are continuing to monitor how the predictions of the model agree with future data. AI is the most dangerous disease linking humans with animals today holding a deadly pandemic potential. Because of that, it has been drawing the attention of many modelers. A multitude of differential equation models have been created to investigate different aspects of the disease. Research supported by the National Science Foundation. All opinions expressed are those of the authors and not of NSF.